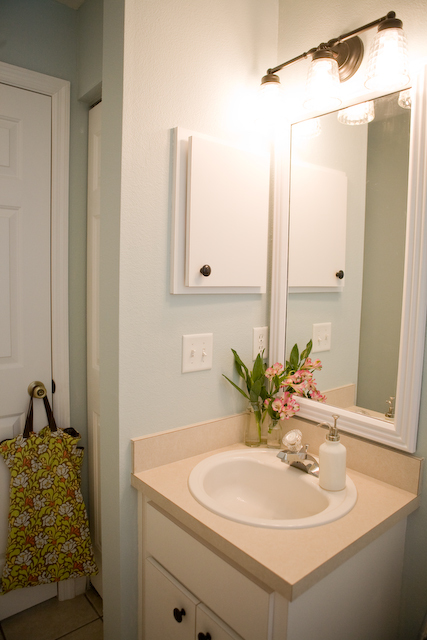 I’m not sure how it happened, but somehow our guest bathroom went completely untouched (as far as decorating goes) for 6 years. Oh the shame. 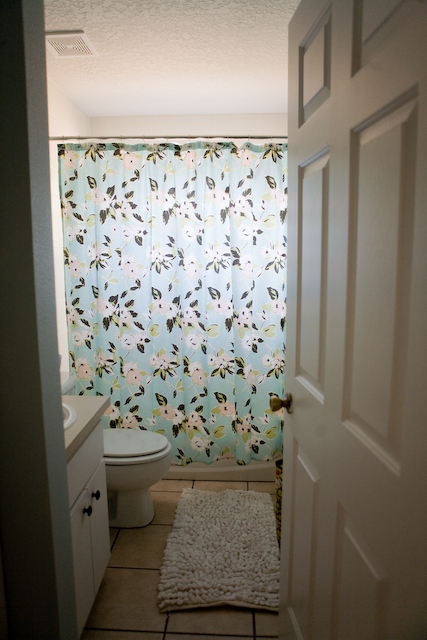 For the longest time, there was just a plain brown shower curtain & simple rug on the floor. 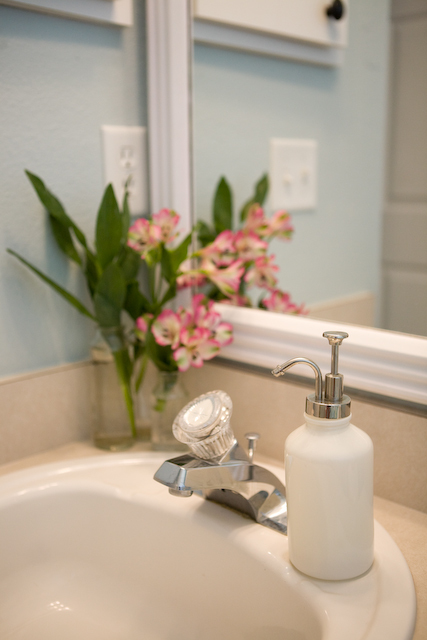 This spring, I got the redo-everything-in-my-house bug, and I started with the guest bathroom. We put a nice, soft blue on the walls to start with. 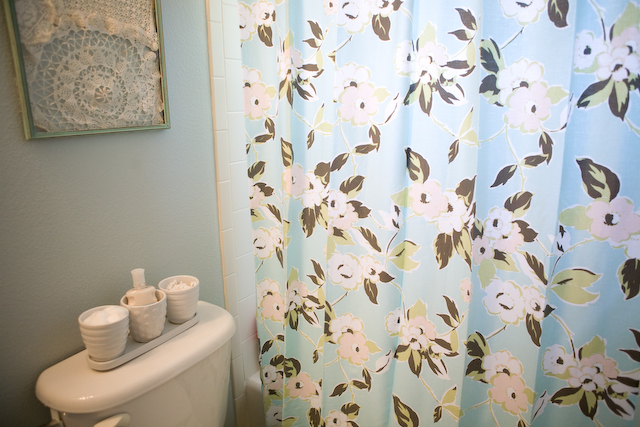 I spent what felt like an eternity on the hunt for the perfect shower curtain. I searched all of these cutesy, expensive stores to no avail. I contemplated making a curtain myself. Finally, I found “the one”. Of all places, the perfect shower curtain was at Target. It was adorable & cheap. Double score. 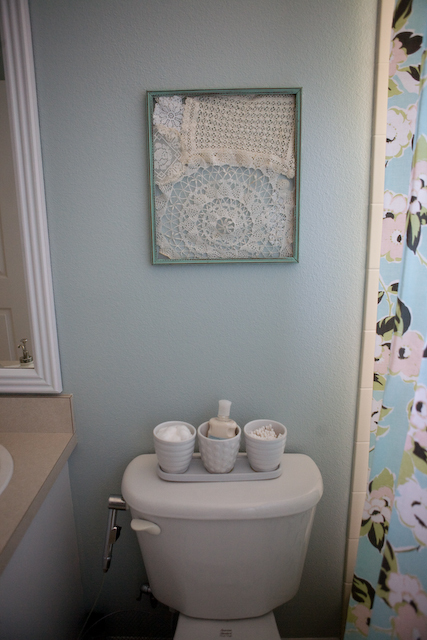 A few accessories and updates later, and we had a lovely guest bath at last. Since this is the bathroom closest to Lincoln’s room, it serves as our cloth diaper headquarters. You’ll get a look at some of the tools that make diapering easier mixed in with the photos here. That silver contraption on the side of the toilet is our BumGenius diaper sprayer, AKA best cloth diapering invention ever. If a diaper is just wet, it gets tossed into the wet bag. If it’s poopy, I simply use the sprayer to wash the poo down into the toilet where it belongs before placing the diaper into the wet bag. 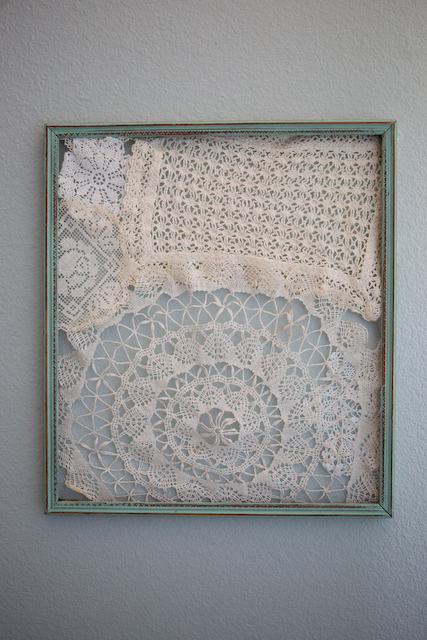 I had a vintage picture frame and some old doilies from the flea market that I turned into some simple art for the wall. A little hot glue and voila. 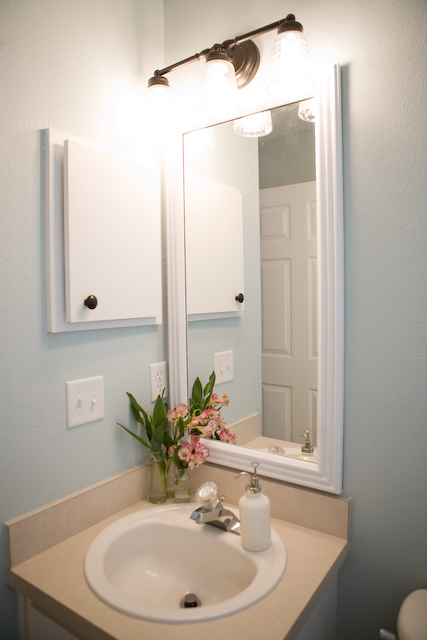 We took down the plain, boring mirror and light fixture put in by the builder. I found a light fixture I loved at Lowe’s, and we had the mirror in another room. I slapped some paint on it and it looks way better than the old mirror. Another peak into our cloth diapering system. That bag on the back of the door is where the dirty diapers hang out until laundry day. I always get asked, “Does it smell?” Well, I do diapers approximately every other day. The first day it never smells. The second day, I just zip the top of the bag and it’s all good. If we have company coming over, I’ll usually move the wet bag to the back of Lincoln’s bedroom door so our guests don’t have to worry about the bag getting in their way when they close the door. 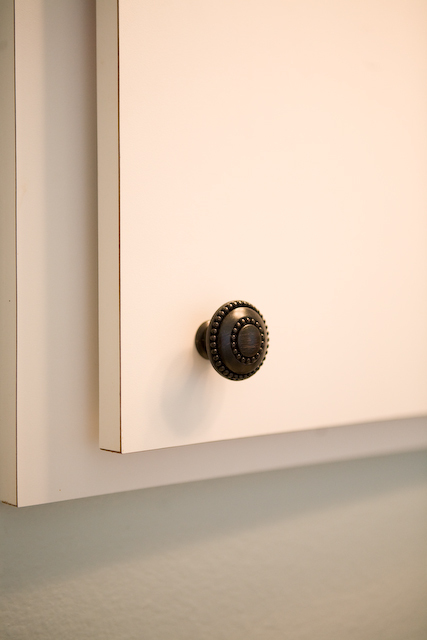 Changing the three cabinet pulls was a really easy & cheap way to update the look of the bathroom. I just finished off my living/dining room redo after FINALLY finding a new light fixture for above the dining room table, so photos of that coming soon. I love it Heidi!! 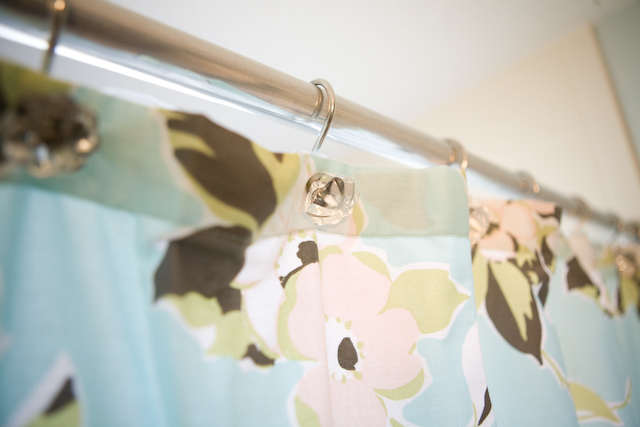 Shower curtains are the hardest things to find and can cost so so much. The redo really looks like you! I cant wait to see other rooms!!! So bright and cheery:) love it.